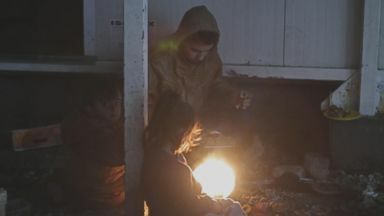 Inside the Moria refugee camp, where thousands of refugees have escaped one nightmare at home only to be trapped in another. their homeland. 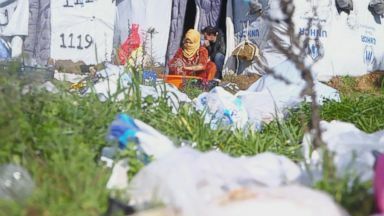 Reporter: On a biting winter's day amidst the cold, the wind and the mud, Syrian children living in squalor being raised amongst the trash as mothers struggle to create a sense of home. This is the refugee camp on the Greek island of lesbos. What is life like here? It is not good. Reporter: It's Europe's dirty secret. Originally built for 2,000 now housing more than twice that number. And to escape the overcrowding some are moving here, to a makeshift camp on the other side of the barbed wire fences. Like Fatima and her family. Oh, your hands are cold. She says life for her three children isn't what she expected. And every day she struggles to keep house and home clean. However futile. Her husband, ab dull jabbar tells me he escaped from one form of death only to find another. But here, he says, it's slow. Back in Syria, death came quicker. And this is why they're here. The war in Syria that continues to rage. Last week this was the scene in the district of ghouta, one of the last rebel-held areas. Over 400 were killed, almost a quarter children. In 2015, this crisis hit a tipping point. With packed stations, crossing the perilous seas and the children, like this 2-year-old washed up on a beach, drowned with his mother and brother simply because they tried to reach safety. Thousands of migrants and refugees have died in the waters that surround Europe over the last few years. Although the absolute numbers have gone down, there's been a significant rise just since the fall. And imagine how desperate you must be to put your kids in a rickety boat and send them out across these seas. In the last four years it's thought more than 13,000 people have died or gone missing in the seas around Europe. And without the Greek coast guard countless more would have drowned here. It's very dangerous. They can lose their life. Reporter: You must have seen some of that. I have seen someone throw a baby. Reporter: For some the journey began in Africa, but most are fleeing the middle East. Traveling through Turkey and on to the shores of Greece. You can see why they come here. Look at it. It's beautiful, relatively prosperous. And safe. But instead of an island paradise, many here have found a living hell. And they're now stuck, unable to leave the island until their claims for asylum are heard. And that's taking months. In some cases years. We're just heading into the camp, this is the most notorious camp here on lesbos. You see up here the barbed wire and the fencing that's designed to keep some people in and keep some people out. On this date we were given a rare but limited tour. We're from ABC news. Here is the section for families. Reporter: The man in charge here is jigiannis. You're a refugee and you are allowed to leave. Some people six months, maybe longer. Yes, of course. 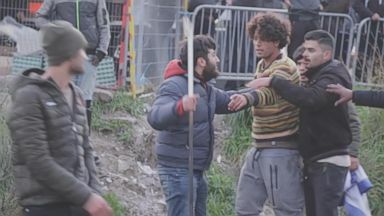 Reporter: He says they're overwhelmed struggling to keep up with the never-ending influx of migrants and refugees. Where will they go, where? In the roads? Reporter: People will ask are the conditions so bad here? The only problem is too many people. It's very difficult. It's not easy. We have a lot of staff for cleaning all the area, but after an hour, it's the same. Reporter: The conditions are inhumane. That was a fight just over food. You can make out the queue up there. People are in line basically collecting trays of food. Someone with secure, someone had an argument, it shows how tense things are here and it ends up in a brawl in a dirty street. The people here tell us the chaos just a small part of the problem. Outside the camp we met this 14-year-old and his friends. When you came across from Turkey, what was it like? Large parts of the camp are closed off to outsiders, but we were getting numerous reports of appalling conditions there. Many we spoke to told us the same thing. And they wants us to come inside and to show us. With the level of complaints we feel we need to see inside for ourselves. We'll try to get to see inside the facilities here. We've seen videosshotbythe residents showing some pretty hideous conditions. To be fair the director acknowledged it was pretty bad. Inside we go searching for Anais. And here's what we found. A third of a dirty tt where they all live, sleep and play. Anais and his family lost touch with their dad while they were fleeing Syria. Months later and they still haven't heard from him. How hard is it for you, Anais, and your brothers and sisters without your dad here? He asked us if we could help him trace his father. He wanted a S.I.M. Card for his phone. What's happening now is Anais and his brothers and sisters are trying to dial their older brother who lives in Germany. When they left Syria, they didn't know what happened to their dad. This is the first chance they've had to try and find out. Hello. Reporter: But there is no word. What's life like here for you and your family in this camp? Reporter: It was tragic. Come here. A sadness settled on the children. Small, vulnerable and lost. Charities like doctors without borders are trying to help those in need. So many already in distress. We're working at our maximum ability at the moment. But many are coming back. Reporter: Many have psychological trauma from the war. Those trying to provide some counseling struggling to cope with the demand. For this 27-year-old the memories of war and the trauma of the camp have made life unbearable. Reporter: You ever had any dark thoughts or bad thoughts because of that? She tells Meese she's attempted to take her own life repeatedly. Like so many here, she's lost in a world without hope. This is someone's blanket. This is where they hang their clothes. That's the entrance to their door. You can see some of the clothes are on the floor in the mud. Conditions in here are really horrible. Even the kids are doing this because of the smell is so bad. And just filth absolutely everywhere. And there's a hidden danger here. Many women avoid the bathrooms at night scared of the risks of sexual assault. I mean, this just -- it's like an informal encampment, not something that's actually run and organized by a government, by the European union. This really is shameful. The camps are a melting pot of misery. Migrants and refugees from not just the Middle East but Afghanistan and Africa. Moria no good, no food. No sleeping for days. Reporter: Many like this man have enough. We're suffering here. They're treating us bad. Reporter: He says he's been here almost two years. We've been thinking they're going to save us. Now they're not saving us. And we're not seeing anything better from them. It's a bad life we're living here. Reporter: Most of these kids have never had a proper childhood. They were born into war. They've grown up on the run. And too many are stuck in limbo still waiting for the security and sanctuary they so badly deserve. For "Nightline," reporting from lesbos, Greece. Our thanks to Ian and his team. Tension is high in the Moria refugee camp as people line up for food. 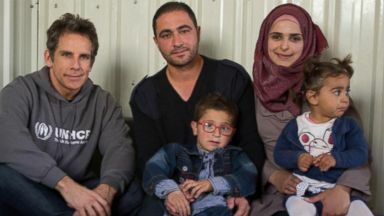 The actor visited Syrian refugee families in Jordan before President Trump's travel ban went into effect. Fires are the center of life in the Moria refugee camp, as people gather around the flames to cook and try to stay warm. The words "Welcome to prison" are spray-painted at the entrance and barbed wire surrounds the camp, which used to be a detention center for rejected asylum seekers.